Donington BSB - I got a mention on the telly! 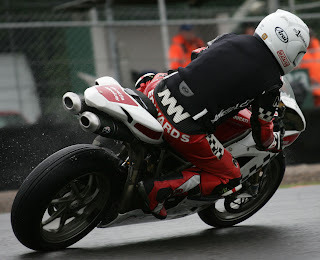 This great action shot from Donington is by Rich Glover. 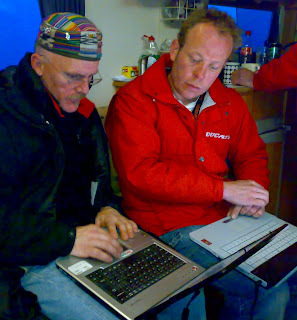 Just looking at the data from the race. 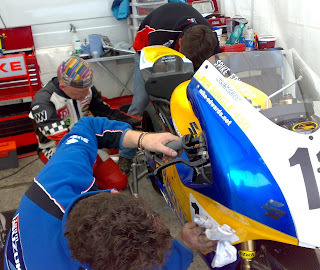 I certainly won't say it was easy, very physical hard work hanging on to the bike. Not bad though finished 13th and did a handful of 1,36s in the process. 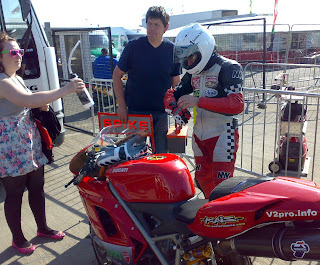 Some three seconds faster than last time I rode in top flight championship competition at Donington - over 10 years ago! 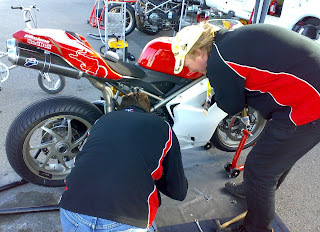 We changed the gearing last night and reduced the traction control sensitivity to 2. Just done ten minutes of warm up laps. Suffering with lack of traction and stability means that I am putting the traction control back to 4! The race is 15 laps in four hours. 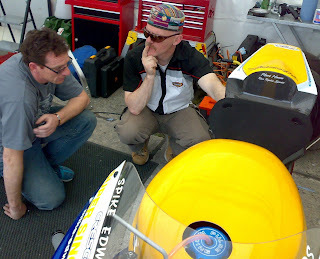 Steve Jordan called round before the session and we did some more tweaks. Did some much faster section times but kept coming in to try different things. The bike is now much friendlier to ride and I might even enjoy having a race tomorrow. More changes to the front end. Last night we 'sneaked' round to Scott Smart's camp and did some measuring. 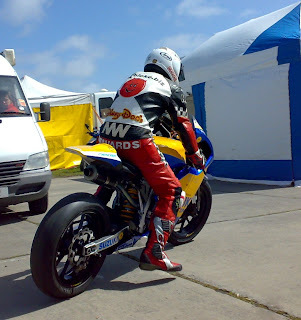 I had followed him for a while on track yesterday and could see how his bike was behaving differently. So changing the springs again and going to try and mimic some of Scott's settings. Things were better and I did go faster qualifying with a 1,37.974 - putting me in 19th. For tomorrow I am going to reduce the air gap in the forks and take some pre load off the back. Richard has improved as well, getting down to a 1,42 dead. 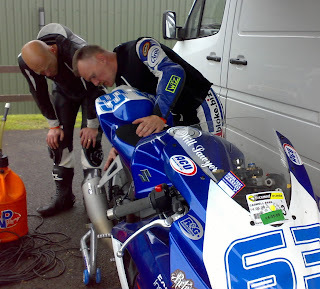 Roy has made some changes to the bike since Oulton. Better in some ways but still not quite how I would like it. Going to put some softer fork springs in for this afternoons qualifying. Done a 1,39.14 that's 20th from 41. 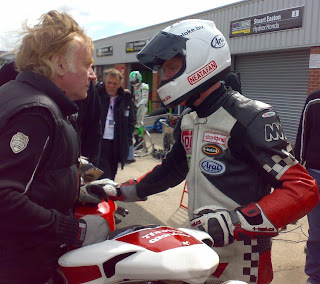 Richard and I are going to spend a bit of time on track working together as he is five seconds back. Good morning from a sunny albeit slightly windy Donington. 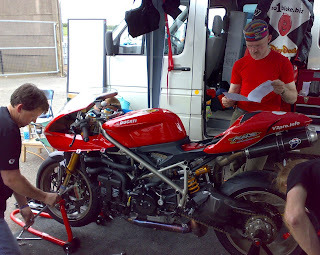 Just getting the Italsport Ducati 1198 ready for practice. Back to Louth today to do a spot more tuition. It started out as a lovely day and then deteriorated into cold wet misery about Lunchtime. 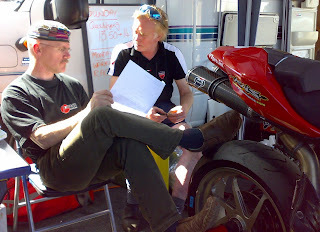 I was working with Will Sawyer, a GSXR Trophy competitor. 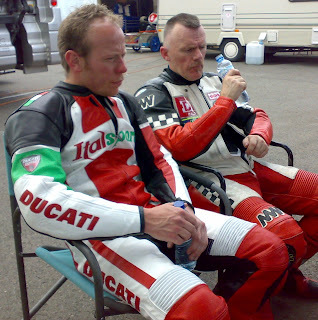 Had a six and a bit hour drive across country last night to come to Snetterton to do some 1 to 1 coaching on 'Frank' . 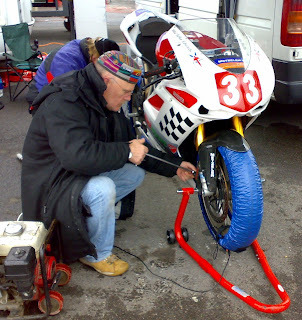 We are working with Nick Wilson a former car racer who now fancies a new challenge - racing bikes! 'Sabina' - Suzuki Moto 450 actionshot. Click on it to see full size image in fantastic detail. 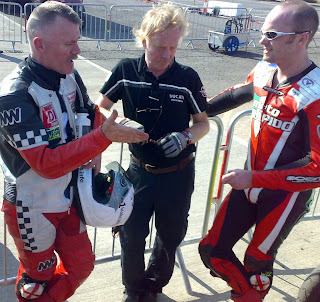 I was looking forward to the race as now we were going to try a slick front and the top technical set up tips offered earlier by "Honest Loz". After a fantastic start a couple of laps later I was up behind Tomes and fancied going for the win. Unfortunately we suffered a mechanical problem with the quick shifter / gear linkage and I had to pull in. 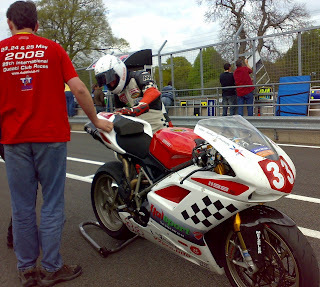 If we can secure enough budget to keep the project 'on track' we could do the next round at Oulton Park the first weekend in June. The weather is glorious today. It is difficult trying to get to the front from 13th on a grid full of mini twins, street fighters and junior power bikes; but I tried my best and managed to finish 6th overall. 2nd moto 450 to Steve Tomes. Went faster, now into the 1,03s - not bad really with just 52bhp. Another race in a couple of hours. 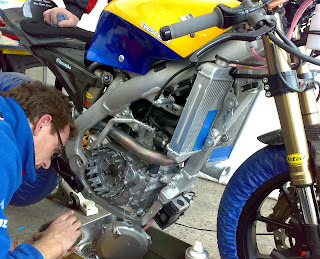 It's an interesting project - the moto 450 concept of taking a motor cross bike and adapting it for road racing. Mark has done a great job, but we both still see it as a work in progress. 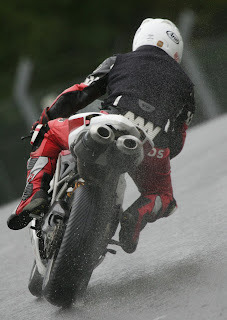 It's definately fun to ride, and it would be fantastic racing if there were 20 of the bikes on track. Just thinking about some alterations for the first race today. Race two - trying more stuff out. Our main problem in the field is that the bigger bikes are baulking our corner speed. 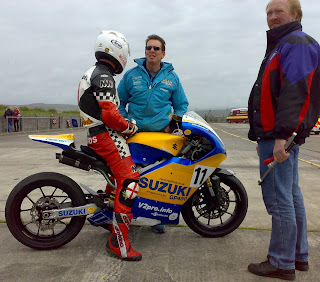 On direct orders from the bike owner Mark Hanna I deliberately jumped the start to try and get a clear run at the front to test how the different profile of the 160 rear felt. 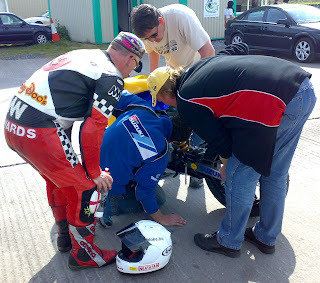 Something is still not quite right though, too much juddering, pulled in before the race finish. Thinking of stuff for tomorrow now. Well Sabina has had her race debut. In just 10 laps we managed with our 52bhp to finish 7th on the same tyre that we started with yesterday morning! The wind direction had changed for this morning so now things are different again. 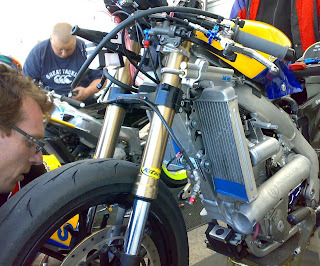 For the race we are going to take the air box off and change the gearing. Did a 1,05.174 - we are mixed in with mini twins, street fighters and junior powerbikes. 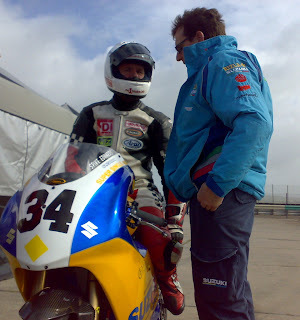 I'm 13th on the grid and looking forward to a good race with my old friend Steve Tomes. Moto 450 - good test day. Sabina was all in all very good from the off; there were really very few modifications to do to make her track worthy. Everyone is now looking forward to being in the thick of competition tomorrow. She's going really well but we want to try stuff. So today is all about experimenting and trying things out as its the first time on track for Sabina. Something we tried that didnt work was a 5" rim with a 165 slick tyre. The increase in grip caused all sorts of problems and chatter so we have quite happily gone back to a 4.5" and a 150 road tyre. Super Single - 2nd session. Did about 10 laps and then it seemed as though the clutch was locked solid. Mark is just pulling it down for a look. He's not found anything yet. 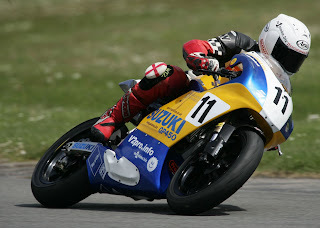 Sabina's first run out - Suzuki moto 450. Well, I've just done the first ever track session on 'Sabina'. I have to say Mark Hanna has done an excellent job with his moto 450 conversion. 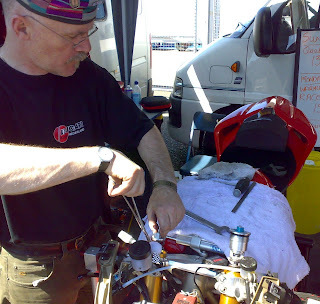 We are going to change the gearing alter the handle bar position and a couple of other tweaks for the next session. This great action shot is by Pete Wileman - 'Frank' is loaded in the van - we are taking him with us to Pembrey, as we are travelling straight on to Snetterton Sunday evening, for Monday, doing some tuition. 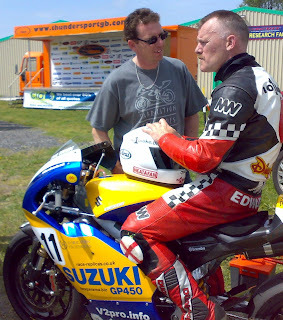 It won't hurt him to meet up with 'Sabina', who I'm going to ride for the very first time tomorrow, in anticipation of competing on her this weekend in the ThundersportGB Championship. Check back here for my regular updates. Paul and Linda Jones of PLJPhoto.com have kindly sent me these action shots from the weekend - I just love zooming in on the spray droplets from the front as well as the rear! Decided not to race, the bike is not right and it’s not worth the risk in these conditions with the limited testing we have done so far. The 1198 is a superb machine and has huge potential, the motor is a monster, massive power everywhere in the power band, it jumps out of the corners whatever gear you are in. I'm sure if we can get another few practices under our belt we will be able to make the breakthrough we are looking for. 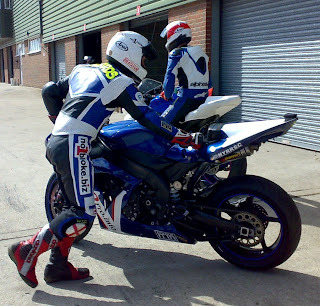 There are loads of ‘toys’ to play with too like traction control, lap timers and GPS data recording built in! Met up with some Throttle Monkeys, Too Tall, Bongo and Lily. The bike is no better. A bit worse in the wet in fact. Had a couple of big moments trying stuff out, 12th fastest. 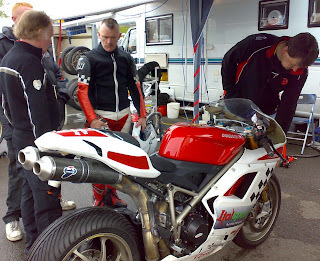 Woken up this morning to rain; so that has ruined the plan to try out the forks and rear shock changes in the ten minutes of morning warm up. Now it will be all different as we put the wets in. 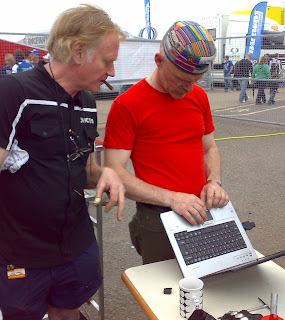 Richard and I are finding it really interesting comparing the data from both our bikes. 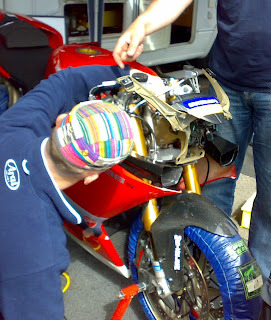 Following some information from Scott Smart's team we have dropped the forks and are trying a harder spring. I want to make some drastic changes to just try and get some sort of effect for morning warm up. Handling is still not right. Even with some mid session tweaks. Gone slightly faster, just 0.3 of a second but still lousy, can not open the throttle like I want to without fear of being chucked off! Well we have gone faster than this morning. But the handling is still far from right. I have qualified 29th with a 1,44.97 Richard knocked three seconds off his practice time to go his best time ever round here with a 1,47.57. Off to see the suspension chap. Richard and I have done free practice. We are not really happy. The bikes are not doing what we want. Going to do some suspension adjustments and hope that will do the trick for qualifying this afternoon. 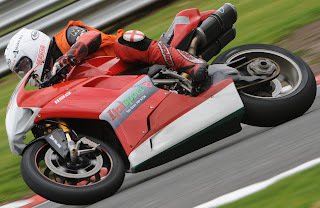 Here we are at Oulton Park. We are just sorting out the body work, graphics, and getting ready for morning practice. 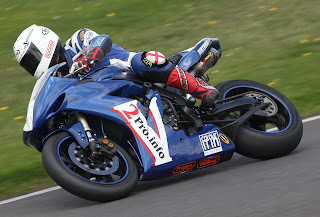 Oulton Park BSB - National Superstock 1000. 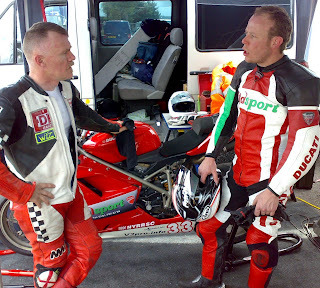 I've known Roy Armstrong for years - we've raced together in the Battle of the Twins in the 90s. 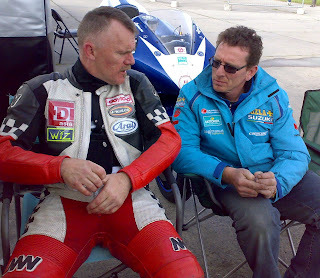 Roy is a great sponsor for Richard Fogg, who I've also ridden with, in the Supermono championship. 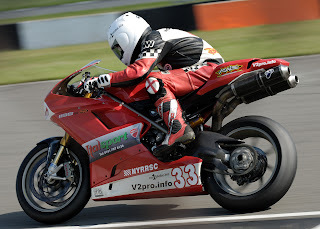 Roy has asked me to support Richard in his National Superstock Championship events, and supplied me with a Ducati 1198 to do it on. Nice! There is no pressure, I'm not going with anything to prove - Richard is the no.1 rider in the team - I'm simply there in a mentoring / coaching role, and Roy says I can do the race if I fancy it. Getting through qualifying would be a start! 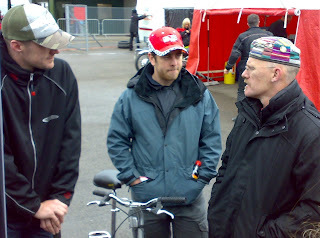 It will be interesting to ride the bike, work with Richard and Roy to set it up, and just see how we all get on.